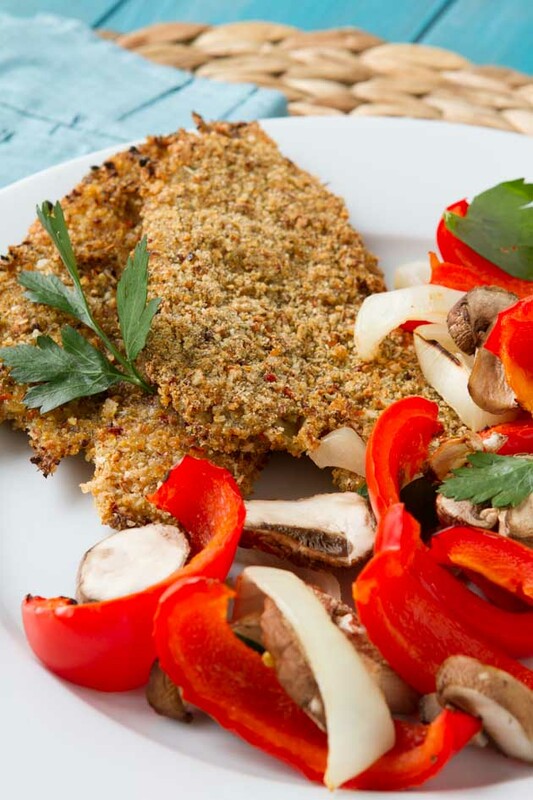 A quick and easy dinner made up of fresh veggies and breaded white fish. Break egg into a medium-sized bowl and whisk with a fork. Set aside. Drop breadcrumbs, seasoning, garlic powder, salt and pepper onto a plate and mix with fingers. Set aside. Transfer egg-coated fillet over to the plate with seasonings and place fillet on top. Sprinkle the mixture over the top, pushing down into the fillet to make things stick. Flip it over and repeat. Lay the fillet on the parchment paper lined baking sheet and repeat with second fillet. Drizzle each fillet with a touch of oil. 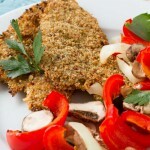 Add vegetables to the side of the fillets and place in the oven for 10 minutes, or until topping is crisp. Remove from the oven and transfer to a plate. Serve with a lemon wedge. Feel free to use approximately 2 cups of whatever vegetables you have on hand. To make grain-free, you could use my grain-free bread recipe and make into breadcrumbs.